Free Bet Up To $500! 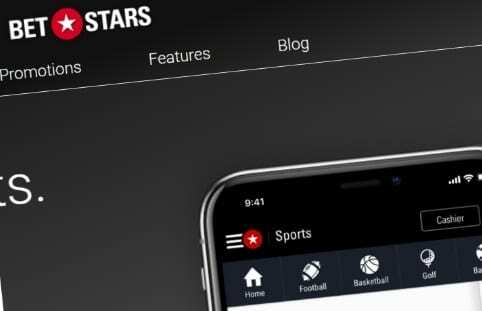 BetStars, sister brand of renowned online poker site PokerStars, may be a relative newcomer to the online sports betting space, but in just a few short years it has effectively closed the gap between itself and the giants of the European sports booking industry. With the debut of BetStars NJ on September 13, 2018, it starts down a journey to gain the same big-name status here in the states. BetStars NJ is the New Jersey sports betting arm of The Stars Group (TSG), and represents an extension of TSG’s gaming partnership with Resorts Casino in Atlantic City. The book’s launch in New Jersey comes a mere four months after the U.S. Supreme Court pulled the plug on PASPA, trailing the debut of first mover DraftKings Sportsbook by about six weeks. The anticipated sports betting app lives up to its namesake in many ways, but for every two pros there is a con. The app’s proprietary platform is in many ways second-to-none, featuring tons of account management features, cool innovations, and top-notch integration with the TSG’s existing NJ online poker product. 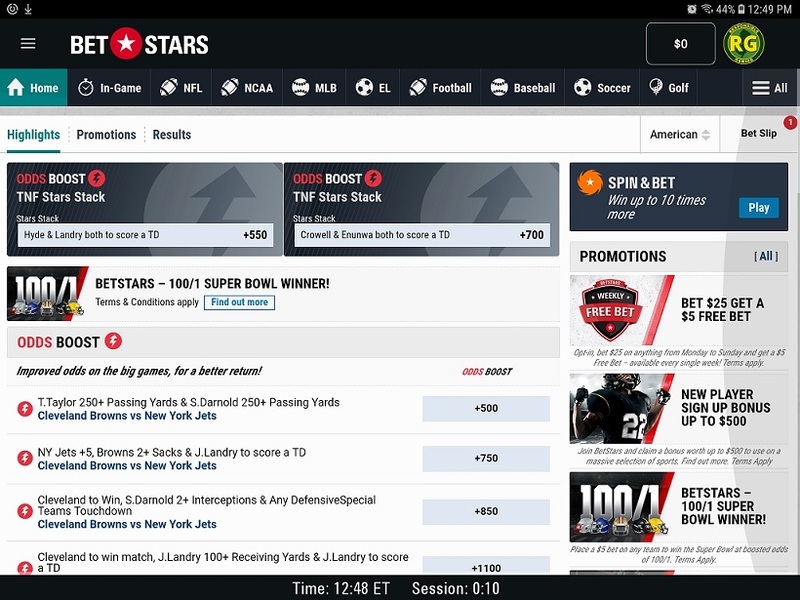 BetStars NJ is also an innovative app, offering players experiences that they just won’t find elsewhere. Bet variety? Solid cashiering? Great promotions? BetStars NJ has it all. Yet, less than stellar pricing in spots, lackluster support, and an occasionally dizzying user interface knocks the book down a peg. There’s still more good than bad, but a little refinement might be in order. Try a risk free bet of up to $500 today! BetStars has taken a traditional route with its latest welcome bonus, but that’s not necessarily a bad thing. The site offers a full refund up to $500 on a player’s first wager, pending that wager loses. If the wager wins, players will receive whatever they’re owed in accordance with the odds, but will not lock down a bonus. Liken it to a freeroll. There are a few caveats worth knowing about, most of which do not diminish the offer. For one, the free bet can only be used on straights and parlays. Spin & Bet and round robins are not eligible. Also, players that made their first deposit with either Neteller or Skrill are not eligible for the offer. This is a very strange nuance, and one that could go easily overlooked without prior knowledge. On the plus side, it doesn’t appear that there are any odds restrictions tied to the free bet. So if you want to play it safe and bet on a heavy favorite with -500 odds, feel free to do so — just know that only the winnings from free bets will land in your cash balance, and not the free bet amount itself. What’s special about BetStars online sportsbook? Great (and numerous) promotions: Hardly anyone does promotions quite like BetStars NJ. From simple matched free bets, to large new player sign up bonuses, and a variety of creative one-off events, there appears to always be multiple offers running, many of which can be stacked, and all of which provide good value for deal-seeking bettors. Innovation: BetStars NJ offers a variety of advanced functionality. Some of its innovations, like “Cash Out” can be found at a few other NJ online sports betting sites, while others, like Spin & Bet and Odds Boost Stacks are unique to the operator. Integration: The BetStars NJ app is intimately connected to the popular PokerStars NJ online poker app, and shares a wallet with the same. We’re expecting TSG to go even further here, integrating its online casino as part of the app, and tying together PokerStars NJ and BetStars NJ on desktop. Bet variety: BetStars NJ may not have the most bets of any operator, but it still offers a ton, among those creative multi-part props that often receive boosted odds. This, along with the innovations BetStars NJ brings to the table, introduces a level of fun that’s absent on more traditional NJ online sports betting sites. Some of the lines on single-game bets aren’t great. The BetStars NJ app looks and functions about as well as one would expect from a company renowned for its cutting-edge and proprietary gaming platforms. Well, maybe nearly as well. Upon logging it (or just opening the app), players will be treated to a homepage that highlights the apps best promotions, its most popular bets (broken out tabularly by sport), and some featured “Odds Boosts”. There are also sections for trending bets and current in-game bets. It’s all very nicely laid out, effectively packing a lot of info into a tight space without putting too much strain on the eyes. Aesthetically and functionally this is a beautiful app, featuring a vibrant yet digestible color scheme, plenty of graphical icons, and that level of responsiveness TSG products are known for. Account management features — and there are a lot of them — are neatly tucked away in an easily accessible side-menu, while key markets are listed horizontally at the top of the screen. In addition, players can easily access PokerStars NJ from the app, with the duo sharing a common wallet. Cashier access, promotional tabs, and user customization settings are all a click away. In terms of bells and whistles, players won’t find better than BetStars NJ. There are a few drawbacks. On occasion, we found that betting options for individual games/matches were slow to load, or didn’t load at all. A simple refresh generally fixed the issue though. Furthermore, the app is a little unwieldy is spots. Finding a market, and straight bets within that market is a breeze. but the bets for an individual game are all sort of just lumped together, sometimes making it difficult to find a bet of your liking. It’s fine for less popular contests, but for say, and NFL game, filters would be nice. Otherwise, BetStars NJ does an admirable job of grouping futures bets, and the combination of the Calendar and Highlights tabs works wonderfully for bettors looking to plan out some higher value bets. The big no-no, and this will be addressed eventually, is that BetStars NJ only available for iOS and Android powered devices, not PC or Mac. We’re pretty sure this is a reflection of everyone rushing to market in time for NFL Season 2018-19, and subsequently releasing unfinished products. How big a black mark this will ultimately be depends on how long it takes for BetStars NJ to launch its desktop platform. Note: The iOS app is not yet available in the app store, but can be accessed via the PokerStars NJ mobile app. Thanks to its integration with the PokerStars NJ platform, BetStars NJ didn’t start from scratch with its cashier, and it shows. There is a robust array of safe and reliable depositing and withdrawal options listed on the app, with the only real notable exception being PayPal, but that’s supposedly coming soon. Once it does, BetStars NJ will rank up there with Play SugarHouse Sports as offering the best payment processing rollout in the biz. BetStars NJ will conveniently store the most recently used deposit methods, enabling bettors to place subsequent deposits much faster than they would be able to otherwise. Deposits generally validate within a blink of an eye, faster than on any other app we’ve played on. One small drawback is that BetStars NJ sets initial deposit limits quite low. Being limited to between $500 – $640 a day and $2,000 a month for most methods feels a little too restrictive. High rollers are probably best off using Skrill, which sets a $15,000 monthly limit, or of heading down to Resorts AC, where they can deposit up to $30,000 a shot ($100,000 monthly limit). Of course, players can also request increased limits, and support will generally oblige, pending all of their previous deposits processed. What are the lines like at BetStars NJ? Players looking for consistently great lines across the board might be mildly disappointed by BetStars NJ. While its NFL point spreads and totals are generally par for the industry, the money lines we observed so far for MLB, NFL, and other sports are pretty mediocre: On average, they’re still a tick better than the money lines posted on DraftKings Sportsbook, but degrees worse than on FanDuel Sportsbook and Caesars. This is not to say that BetStars NJ is devoid of high value opportunities, far from it. In addition to myriad promotions, many of which significantly bolster a player’s expected value, the app will occasionally post a really competitive pre-game money line. So keep an eye out. Not to mention, players that like to roll the dice on elaborate prop bets, will often get to do so on BetStars NJ at better odds, thanks to the app’s Odds Boost innovation. And we can assure you that Odds Boosts aren’t just a once-in-a-while gimmick. No, instead it seems like all major market games feature a variety of these reduced juice wagers. Regular old prop bets are probably best avoided as the lines on even odds outcomes generally hover around -120, which isn’t great. And in-game odds are predictably worse than their pre-game counterparts, but not by any material degree more than they are on most other NJ online sportsbooks. BetStars NJ might be a little light on markets, but it nearly makes up for it by offering an array of bets within each market, some of which are presented via betting formats that can’t be enjoyed elsewhere. Does it sport the most bets of any NJ online sportsbook? No, certainly not, but it at least ranks near the middle, and especially excels in the soccer market. In terms of betting formats, BetStars supports most of the standard fare including straight bets, totals, futures, parlays, and props. Surprisingly, teasers are not available on the site. To us, this signals that BetStars perhaps hasn’t fully adapted to the NJ market, as teasers are predominantly tied to popular American sports like football and basketball. Also, players big on betting props might be mildly disappointed, as while BetStars NJ does offer a healthy number of obscure team and individual bets, that number is still less than half of what we’ve seen at other books. In-play, a betting format where bettors can place wagers on a game in-progress, is all the rage of late. So it was little surprise to find the option featured front-and-center on the BetStars NJ app. BetStars NJ does a serviceable, but hardly mind-blowing, job with in-play. Technically, everything appears up to snuff, with bets updating fluidly, and the server responding swiftly to in-play bet requests, so much so, that there was never really a question of whether we’d be shut out of a line. Yet, for a European operator with oodles of cash, we just expected a little more variety. In fairness, for the bigger contests the app does offer a decent swatch of in-play options, and we’re sure that number will improve even further over time, but the average contest might only support half-a-dozen in-play bets or less. Better than nothing, but hardly enough to differentiate BetStars NJ from the pack. Thanks to the cash out feature on BetStars NJ, players now have a legitimate way to quickly modulate their risk. Cash out functions pretty much how one might expect, granting players the option on straight and parlay bets (pre-game and live) to Get Out Of Dodge, so to speak, locking up less cash then they would if they won, but more than they would if the bet was lost. The exact amount of a cash out is a reflection of the original wager size and the current in-play odds. For instance, if the Philadelphia Eagles are ransacking Atlanta Falcons 35 – 10 at halfway, and you bet the Eagles, well a cash out would probably pay close to the amount if the bet was actually won. Flip the script and you might get a few bucks back for every hundred wagered. What would a Stars app be without some sort of slot machine mechanic? Spin & Bet is perfect for action junkies that don’t mind giving up a little for the chance of winning a lot. How it works is that bettors first allocate 10% of their bet to the fates. Then, BetStars NJ determines via RNG if the remaining 90% of that wager will receive an enhanced payout, should it win. A little less than half the time (47.7%) it won’t, but the other times, it’ll receive a bump between 1.2x and 10x. Naturally the odds of hitting a top multipler are significantly lower than a smaller enhancement. For instance, the odds of landing on 1.5x are a respectable 7.5%, but players only have a 1 in 1,000 chance of scoring that elusive 10x multiplier. Give BetStars NJ credit for implementing a feature that introduces an added element of fun to sports betting, which on average will see players exchange 10% of their wager for augmented payouts more than half the time — not bad. Get a $500 Free Bet Now! There’s perhaps no other NJ online sportsbook that does promotions as well as BetStars NJ. Beyond its lucrative welcome package, the app offers players a multitude of ways to boost their chances of success. Its promotional vehicles run the gamut from small on-the-fly bonuses, to season long events designed with maximum sweat in mind. Matched free bet: Bet a certain amount, receive a free bet in accordance with the size of the initial wager. As an example, BetStars NJ rolled out a promo at launch where players would receive a $5 free bet on their first $25 in wagers, weekly. Expect more of these simple, yet generous, promotional types in the future. Deposit bonus: Deposit a certain amount and receive a percentage bonus, capped at a specified amount. Usually comes affixed with a modest wagering requirement. Odds Boost: More regularly occurring event than promotion, BetStars NJ frequently grants players better odds on an array of prop bets for popular contests. Be on the lookout for the red fire symbol next to an event, as that indicates Odds Boosts bets are available. Super Boost: Similar to Odds Boosts, except more tailored toward gamblers. Instead of winning enhanced payouts on straight bets, players that opt-in to Super Boosts will net a bigger score when they hit a parlay. Beyond the aforementioned, we’ve also seen the occasional high-value one-off. A good example would be 100/1 Super Bowl Winner, which offered players 100/1 odds on the first $5 of a Super Bowl future bet. That’s a pretty big deal considering several teams were listed at 10/1 or better, opening the door for players to win more than 10x what they would normally. It was recently announced that PokerStars NJ will be transitioning away from its existing VIP program, and we expect BetStars NJ to do the same. In its stead will be Stars Rewards, a loyalty program that tailors rewards around how players bet, across all TSG products. At its core, the program is based around earning enough rewards points via real-money play to fill up a progress bar and earn a Chest. In the Chest will be a swatch of personalized rewards, which may include StarsCoin (which is the company’s virtual currency), free play, and other special prizes. But let’s step back for a second, as saying that the rewards are fully personalized would be a bit of a misnomer. Instead, it’s more of a personalized range of rewards, with the exact prizes within that range determined by chance. There are six levels of Chests, ranging from a Red Chest, which can hold up to $50 in rewards, to a Platinum Chest, which is potentially worth $1,000. However, winning the maximum amount is a 1 in 10,000 crapshoot. More commonly, Red Chests will be valued at a under a quarter, and even Platinum Chests will only be worth $62 or less 95% of the time, with additional featured rewards (which are offered regularly) bolstering the average prize amount. In order to earn Chest upgrades players will have to first win four Chests in a day. They can facilitate the process of earning upgrades by applying Boosts, which double the rate at which rewards points are earned. If this all sounds complicated, it is — or at least the inner workings are. But in terms of earning rewards, it’s as simple as wagering real-money on the app and seeing what you get. We expect Stars Rewards to go live across all TSG products by the end of 2018. BetStars NJ offers an array of support options, with some being more useful than others. For the most common inquiries there is a FAQ, which is pretty well laid out and covers a diverse array of topics. For players in need of more personalized attention, their best bet might be to contact an agent via Live Chat. Wait times to get in touch with an agent were on the short side, however, responses often took a while, and we got the feeling that more often than not, support wasn’t properly equipped to answer our trickier inquiries. But they were pleasant enough and did at least seem to be making a solid effort. There is also a contact support form, which appears to be bugged, as we weren’t able to use it. In theory, players can use this form to write messages to support, which will be responded to via email. Along with their message, players are encouraged to select relevant categories and sub-categories, so that it’ll be easier for support to kick the question to the proper department, resulting in a faster turnaround time. BetStars NJ does allow players to call in directly. Instead they must request a callback. All in all, our support experience was a mixed bag, and we expect somewhat better. After Amaya’s acquisition of PokerStars in June 2014, the company began exploring opportunities outside of poker, turning its focus partly to sports wagering verticals. In August of the following year, the iGaming behemoth purchased daily fantasy sports (DFS) site Victiv, later rebranding it as StarsDraft. The newly-minted StarsDraft had its official U.S. launch in September 2015, competing with the likes of industry giants FanDuel and DraftKings. Only one month later, however, the company decided to limit operations to just four states, citing regulatory concerns. After StarsDraft’s entry into the DFS market, the company pushed forward towards offering full-on sports betting in jurisdictions outside of the U.S., where the industry remained explicitly illegal. While Stars had taken its first sports bet back in March 2015, it didn’t spin off its sportsbook as a standalone site until that November, when it purchased the BetStars.com domain. One month later, the operation went live, offering 23 betting markets, including eSports. The site was originally powered by technology supplied by UK sports platform provider Amelco. True to form, PokerStars soon began innovating in the space, launching a feature called Spin & Bet – a hybrid sports game which bore similarities to the popular Spin & Go poker games. In addition, it began fusing poker with sports wagering, offering betting odds on the PCA Main Event final table and the $25K High Roller. Other innovations followed, like BetStars Sports Jackpots, a mix between DFS and real money tournaments. PokerStars launched its online poker product in New Jersey in 2016 through a partnership with Atlantic City’s Resorts. When sports betting was made legal in the state, it continued its relationship with the casino, launching its BetStars NJ Android app on September 19, 2018. PokerStars’ sports offering was the eighth sports betting app to launch in the Garden State, and was part of a flurry of sportsbooks to go live during the time period. Get your Free Bet Now! BetStars NJ has quite a bit going for it, including a great look, top-flight promotions, niche innovations, and a flexible cashier. Yet, the pricing isn't always competitive with what some other NJ online sportsbooks offer. Mediocre support, and the lack of a PC product (so far) also take it down a notch.